Sure you son may have decided that his ultimate enemy in life is Under Zero. And sure he, and six of his closest friends all dress in the same out fit, just different colors. And yes he may claim to be an undead ninja. But you know he is still your little guy...maybe. He is still the same kid who wanted to play on your Super Nintendo for hours after finding it in the basement. The same kid who decided he wanted to become a plumber after playing Mario Bros. And, made his cousin do the truffle shuffle before letting him in the house last week after watching The Goonies. He really likes to mimic things he sees in video games, and movies. 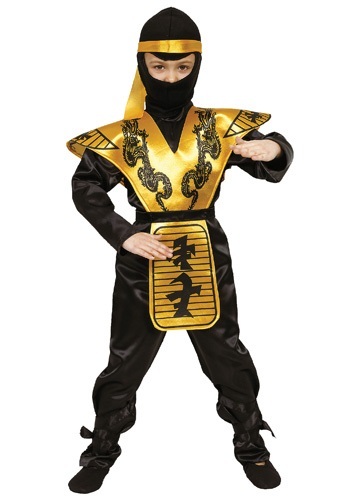 This year, after he has spent days—no, weeks playing Lethal Konflict, let him dress up as his favorite character from the game: Psuedoscorpion in this Boy's Mortal Ninja Costume. He might just find that he does in fact have an enemy named Under Zero who can freeze people at will, so your son will have to study up on his ninja skills. Because while he may think he is undead, you will have to remind him just how flesh, and blood he really is. Maybe for the next game that you let him play, make it the Sims. At least he might become interested in being an architect. We are sure they make more money than undead ninjas.